Anant Chaturdashi, also known as Anant Chaudas, is popularly noted for the immersion of Ganesha idols after Vinayaka Chaturthi – Sarvajanik Ganpati Visarjan. It falls on the 14th day of Bhadrapad shukla paksha (waxing phase of moon) in a traditional Hindu calendar. Anant Chaturdashi 2019 date is September 12. Anant Puja is held on the day at homes mainly in Maharashtra. 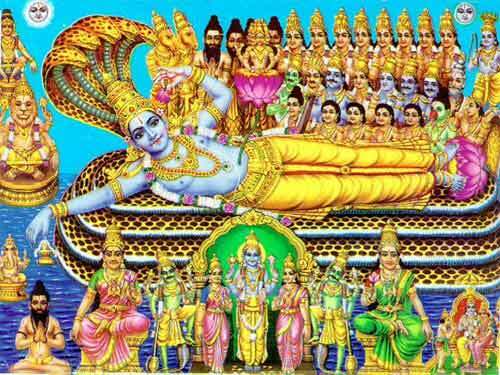 Ananta Padmanabha Vrata is observed on the day in South India and is dedicated Lord Vishnu. Ananta Chaturdashi is believed to be the day when Lord Vishnu appeared in the form of Anantha Padmanabha – the Ananta Sayana form of Lord Vishnu – reclining on Ananta. In the Mahabharata, Shri Krishna advises Yudhishthira to observe Ananta Vrata for 14 years to get back his lost kingdom. A fast is observed from sunrise to sunset by Lord Vishnu devotees. The observance of Anant Chaturdashi pooja secures freedom from all sorrows. The word ‘Ananta’ means endless and devotees believe that Lord Narayana will clear all the difficulties in one’s life, if the Ananta Vrata is observed with utmost devotion. Some people observe this Anant Chaturdashi Vrat continuously for 14 years. The Ananta Shayna form of Lord Vishnu is worshipped on this day. The reclining posture represents the state of inactivity and is the form of Narayana prior to the evolution of the worlds and creation of the living beings. The main ritual on the day is the tying of a sacred thread. The thread is first sanctified by placing it along with the idol of Lord Vishnu in the reclining form. On the day Anant Chaturdashi day, devout Hindus in Maharashtra perform Vishnu Puja, Krishna Puja and Satyanarayana Puja. The puja also consists of Yamuna Puja, Shesha Puja and Anant Puja. Water in a kalash (pot) is assumed to be Yamuna, Shesha is made of grass and Anant consists of 14 knotted threads. The 14-knot thread is known as Ananta Dharam. The number 14 is of great significance in Anant Chaturthi Puja – during puja 14 flowers, 14 fruits, 14 dry fruits, 14 different types of leaves are offered. The food prepared also consists of 14 types of vegetables and grams. Sweets and Chana Dal are also made as prasad. In strict sense, Ananta Daram is a cotton band formed of fourteen threads. In some places, the band consists of 14 knots. Women tie the Anant Daram on their left hand and men on their right. Serpent Ananta is also made using Durva grass and is placed on a bamboo basket and worshipped in some places. There is no fasting observed but vegetarian food is eaten on the day. Performing annadanam or food donation on the day is highly meritorious.